Selecting the most memorable moments from an unforgettable journey through Kakadu and Arnhem Land is a tough task. Nevertheless, here are a few of the highlights. The stunning scenery springs to mind. Kakadu’s awe inspiring, ancient landforms, ranging from expansive tracts of savannah to sheer cliff faces and majestic rock escarpments; Kakadu’s colours, transforming the landscape, constantly changing over the day, and culminating in flaming reds at sunset – well worth the climb needed to witness this grandeur; Coburg Peninsula’s pristine, windswept beaches and peaceful, secluded coves; billabongs, wetlands and various other waterways, widespread in Kakadu and Arnhem Land, supporting an immense variety of plant life, birdlife and other wildlife and delighting photographers. Speaking of wildlife, we commonly sighted crocodiles and the clear and present danger of croc attack was evident via strategically placed warning signs and our guide, Adam’s, repeated warning: “Don’t go too near the water’s edge”. The natural beauty of Kakadu and Arnhem Land provided a perfect backdrop for learning about traditional Aboriginal cultural beliefs and practices and for seeing these in action currently. We visited an outlying Aboriginal community designing and creating a range of textiles, clothing, jewellery, and artworks for sale. We were taken to various rock art sites made accessible to tourists – so many, these regions constitute an awe-inspiring ancient outdoor art gallery. Led by traditional owner, Tyrone, we walked further off the beaten track to significant burial and rock art sites few other white people have seen. Immediately afterwards, with a flick of the wrist and his cigarette lighter, Tyrone demonstrated that burn off, a traditional means of land management is still practised. Tyrone’s initial, terrifying Wall of Flame soon subsided into a gentle smoulder. Cultural Information centres throughout Kakadu and Arnhem Land highlight the horrors historically perpetrated on Aboriginal people by the British. Regrettably, the impact of such injustices on Aboriginal people is enduring. On the flip side of the cultural coin is Victoria Settlement, a short-lived 19th century former Colonial out- post on the Coburg Peninsula which proved unsustainable. The cliff top ruins of this Settlement, built in the tropical jungle attest to the tragedy of unyielding officialdom and lack of cultural sensitivity. 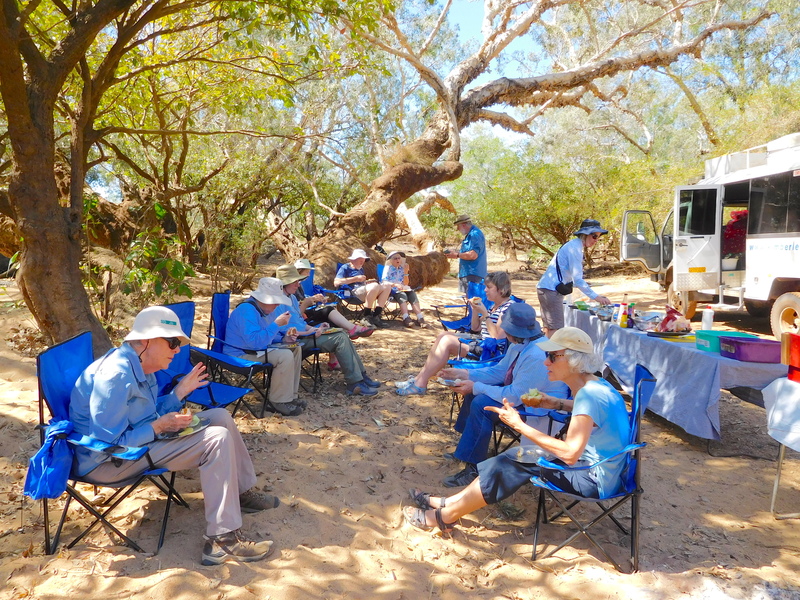 No “ARPA Arnhem Land Adventure” report would be complete without reference to campsites, cooking, and camaraderie. For three nights, home was Jabiru Caravan Park, where bungalows and tent sites with much appreciated ensuites accommodated us weary walkers. In the Garig Gunak Barlu National Park sand dunes leading to gentle waters bounded our campsite. It was idyllic but we knew better than to “GO TOO NEAR THE WATER’S EDGE”. On the crucial issue of cooking, Adam (always affable and impressively informed) created fabulous feasts for us, no mean feat, considering how many specific dietary needs Adam was required to accommodate. Camaraderie and co-operation are the core of the ARPA camp experiences. Thanks to our beloved leader, Adam (Kimberley Off Road Adventure Tours) and Lorraine (ARPA) for compiling our extraordinary itinerary. This entry was posted in News by Chris. Bookmark the permalink.